Our expanding global network is a key point of difference when working with Agri Labour Australia. To source the best agriculture staff for every possible position – in the numbers required – we have developed an integrated agriculture recruitment network. 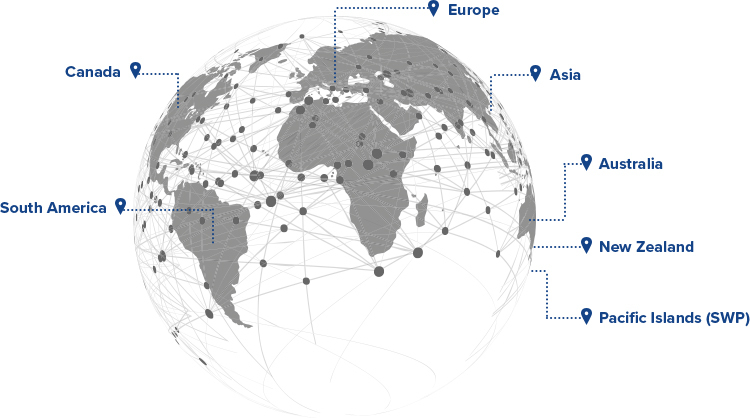 Our connections extend from Australia to the Pacific Islands, Asia, Europe and even the Americas. With so many qualified candidates motivated to work in Australia and a shortage of suitable local workers, we have tapped into valuable international people streams. This gives us greater reach and opens up fresh pools of potential candidates for any agricultural job. The Agri Labour Australia team includes international recruiters from Taiwan, Malaysia, Indonesia, Estonia and Germany. Our multi-cultural team help us navigate strict recruitment and screening processes without being limited by language and cultural barriers. Our Australian-owned and operated company is proud to have a global presence that allows us to source the best agricultural staff for you in the numbers you require. Domestically, Agri Labour Australia has offices in Queensland, South Australia, Tasmania and Victoria. We place agricultural candidates in farms nationwide. We believe in a local approach and growing our networks here at home as much as possible. Via our sister company, Global Connections, we have a manpower licence in Taiwan that gives us the ability to reach candidates seeking work in Australia. This licence allows us to source candidates throughout Asia from Global Connections head office in Taiwan. Strong and capable backpackers from Canada have been an invaluable source of labour and laughter since Agri Labour Australia’s inception. We regularly keep in touch with our Canadian candidates – some of whom have returned multiple times despite the distance. We are proud to have placed qualified workers from countries including Estonia, France, the Netherlands and Germany. These nations have proved a valuable candidate-sourcing stream for Agri Labour Australia, with networks accessed using the power of digital. We share an agricultural heritage with our neighbour to the east, and this translates to quality candidates with the right to work and live in Australia. Popular on farms nationwide, our Kiwi candidates have proved hard-working and enthusiastic over the years. Hard-working candidates with agriculture experience are often recruited on the ground via our contacts in the Pacific Islands. These workers may be permitted to return to Australia to work year after year under the Seasonal Worker Programme (SWP). We regularly recruit casual staff from South America who are eager to experience the Australian way of life and save money to send back home. Do you have staffing requirements?